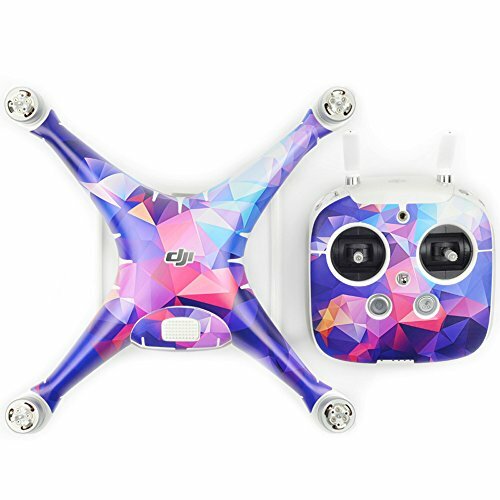 It is made from high-quality, water-resistant polymeric PVC material, by 3D relief printing, to protect your DJI Phantom 4 Quadcopter Drone from dings and scratches. Fashionable design makes your DJI Phantom 4 more eye-catching. Comes with instructions, easy to apply and remove at any time without any damage to the your phantom. Perfect cutting fits your DJI Phantom 4 quadcopter well. It is the best choice to add style to your DJI Phantom 4 Quadcopter Drone. DECAL ONLY - DJI Phantom 4 Not Included! Any issue, plz contact us without hesitation. We'll try our best to help you. Perfectly fits DJI Phantom 4 quadcopter drone body, remote controller and battery. Made of high-quality, water-resistant PVC material, by 3D relief printing, to protect your DJI Phantom 4 Quadcopter Drone from dings and scratches. Comes with instructions, easy to apply and remove. Perfect cutting fits your DJI Phantom 4 quadcopter well. Package included: Package included: 1 x Phantom 4 body sticker, 1 x remote control sticker, 2 x battery sticker. DECAL ONLY - DJI Phantom 4 Not Included! If you have any questions about this product by TMO, contact us by completing and submitting the form below. If you are looking for a specif part number, please include it with your message.